From Rob Thomas, the creator of the television series and movie phenomenon Veronica Mars, comes the first book in a thrilling mystery series that picks up where the feature film left off. Ten years after graduating from high school in Neptune, California, Veronica Mars is back in the land of sun, sand, crime, and corruption. She’s traded in her law degree for her old private investigating license, struggling to keep Mars Investigations afloat on the scant cash earned by catching cheating spouses until she can score her first big case. Now it’s spring break, and college students descend on Neptune, transforming the beaches and boardwalks into a frenzied, week-long rave. When a girl disappears from a party, Veronica is called in to investigate. But this is no simple missing person’s case; the house the girl vanished from belongs to a man with serious criminal ties, and soon Veronica is plunged into a dangerous underworld of drugs and organized crime. And when a major break in the investigation has a shocking connection to Veronica’s past, the case hits closer to home than she ever imagined. 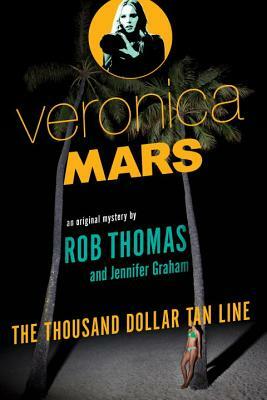 In Veronica Mars, Rob Thomas has created a groundbreaking female detective who’s part Phillip Marlowe, part Nancy Drew, and all snark. With its sharp plot and clever twists, The Thousand-Dollar Tan Line will keep you guessing until the very last page. Rob Thomas is the creator of the television series Veronica Mars and the cocreator of the television series Party Down. He lives in Austin with his wife and two children. He hasn’t fully recovered from Ray Allen’s three-pointer in Game 6 of the 2013 NBA Finals. Jennifer Graham graduated from Reed College and received her MFA from the University of Texas at Austin. Her short stories have appeared in The Seattle Review and Zahir. She currently lives in Austin with her husband.